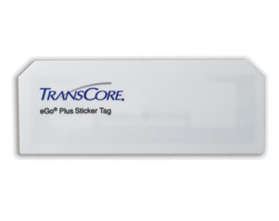 The eGo Plus Micro Mini Sticker Tag supports Super eGo (SeGo) and American Trucking Associations (ATA) protocols. It is suitable for a wide variety of automatic vehicle identification (AVI) applications, including electronic toll collection, airport/ground transportation management, parking access, and security access. When used with TransCore readers, security features prevent data corruption, data alteration, and tag cloning. The eGo Plus Micro Mini Sticker Tag supports factory locked data fields for Tag ID, customer, and user information. This tag also supports open data fields that can be written by the agency.